Downloads 0 Requirements 6MB HD. Direct X drivers. Video card 3D hardware acceleration. PajerGallery 3D allows you to view 40 digital pictures or electronic art work within a 3D Gallery environment. 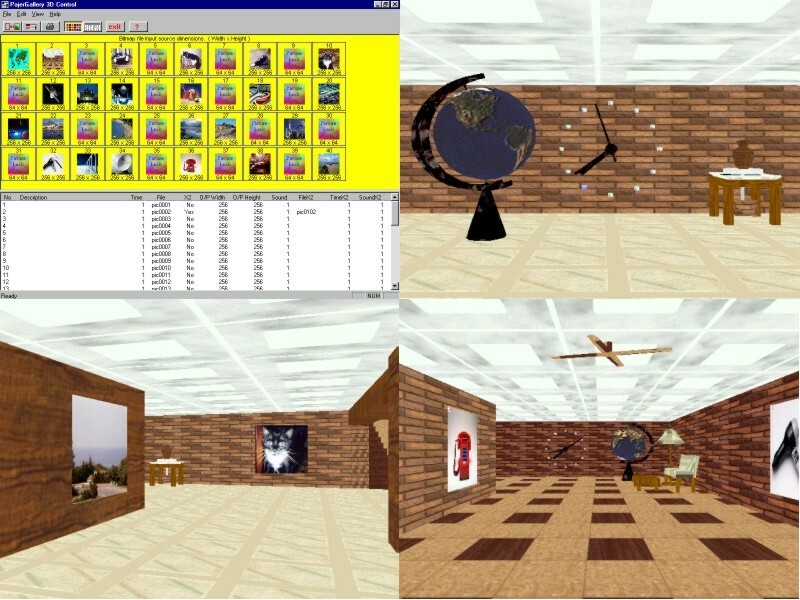 The software moves the user around a 3D Gallery stopping to view each picture. An optional high quality sound recording can also be associated with each picture with full control over how long you stop at each picture. While you move around the Gallery you can pause or go back a picture. There are a number of 3D models within the Gallery including a real time 3D clock. The 3D animation is continuously looped back to the start so is ideal for showcasing art work and digital pictures in any environment including personal, commercial, advertising, exhibition and education. With its ability to associate a sound recording with each picture Business could use it to introduce its products, services or people to new clients. A great way to find out about an organisation. Since the intensive computerisation of schools and colleges a huge archive of electronic art work and digital pictures have been accumulating and PajerGallery 3D would finally fill that niche schools have been looking for. Other uses are family trees, personal history and hobby interests. The Control program displays all 40 pictures and can transfer a copy of your picture into PajerGallery picture folder ready to use. Also add exit password, adjust speed and animation mode from the Control program. Requires DirectX 7.0 or above and your video card must be able to support textures. Uses the popular Mircosoft(tm) Bitmap file format.